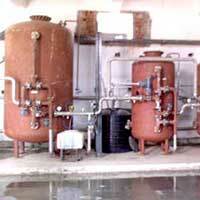 We are amongst the noted Industrial Filtration System Suppliers, Manufacturers and Exporters. We offer genuine quality Industrial Filtration System, extensively used in many chemicals, automobile, textile, pharmaceuticals industries etc. for their respective industrial usages. These drinking water filtration systems are available in individual as well as multiple port valves. Our Filtration Systems, with advanced Water Treatment Components are highly demanded and thus, we are recognized as one of the prestigious filtration system Exporters from India. 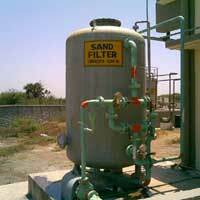 Pressure Sand Filters Pressure sand filter is used to filter out turbidity from the raw water up to a load of 25 âï¿½ï¿½ 50 NTU. 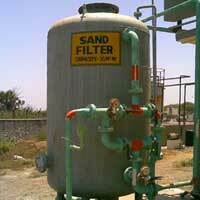 Fine mesh sand is used as the filtering media, supported with different layers of media. Dual Media Filters Dual Media filter consists of sand and Anthracite as filtering media. Anthracite has a higher dirt holding capacity and hence can be operated at higher velocities. Dual Media Filter can be typically used to filter out turbidity in the raw water up to level of 50 âï¿½ï¿½ 100 NTU. 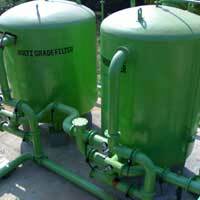 Activated Carbon Filters Activated carbon is used for removal of Free Residual chlorine i.e. de-chlorination, odor, color, and organic matters from water. Activated carbon is used as media for removal of above said impurities and is available in various Iodine value. Activated Carbon works on surface absorption principle. Iron Removal Filters Iron Removal Filter is used to remove Iron from water. IRF consists of a Manganese Dioxide layer, which works as a catalyst in converting Ferrous to ferric, which can be easily precipitated and filtered physically. 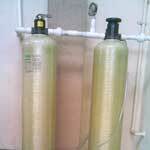 Softeners Ion exchange softening is the most commonly used method of removing hardness in the water. The Softener contains Strong acidic cation exchange resins in Sodium form. When hard water passes through the resin, the calcium and Magnesium ions are exchanged by resin and an equal number of sodium ions are imparted to the water. The resin has finite capacity for removal of Calcium and Magnesium ions and after this capacity is exhausted, the resin will have to be regenerated by salt to bring it back to the sodium form. 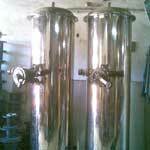 We offer this model of Filtration System, which is designed for multifarious applications by expert engineers. Consisting of numerous filters, the Filtration System offers maximum quality and quantity of filtered output.